It is worth listening to. The Arab spring has made things worse in the Middle East at the same time US development is growing. Car thief sprayed with invisible dye in police trap They know they have their guy when he looks green with Zombie like eyes. Members of Congress and their staffs will be able to buy health plans that pay for abortions, even though the premiums are paid for largely by taxpayer money, the Office of Personnel Management ruled Monday. Lawmakers and their aides are being required to ditch their government-sponsored plans and buy insurance on state-based health exchanges, though unlike most people on the exchanges, the staffers and members will still have most of the cost of their premiums paid for by their employer — in this case, taxpayers. Federal law generally prevents taxpayer money being used to pay for abortions, but OPM said that the health care plans offered through the exchange were private. The agency also said it will make sure the money is segregated so that the portion that pays for abortions comes out of the employees’ own contribution, which amounts to about a quarter of the premiums. Two Marines were killed and eight other personnel were wounded. Six aircraft were destroyed by the Taliban, the largest loss of Marine aircraft since the Vietnam War. Somali Militants Defy Efforts to Stem Their Income The Shabab, which claimed responsibility for the deadly mall siege in Nairobi, makes money through illegal endeavors and even employs a team of accountants. It sounds like the current strategy is not working and they need to develop a new one. One of the problems is that this administration has not attracted people with the kind of imagination needed to come up with a new plan. They have in fact alienated some of the best minds in the counterinsurgency, counter terrorism community. The eagerness for retreat has led to renewed violence in Iraq and no receding of violence elsewhere in the Muslim world. Objectively speaking, Texas gubernatorial candidate Wendy Davis may champion the least popular political position in the country. Not that you’d know it when reading most accounts of her rise to prominence. Ever since the summer, when Davis filibustered the legislative session to delay the passage of a bill banning most abortions after 20 weeks of pregnancy, much of the coverage has avoided accurately describing why we know who Wendy Davis is in the first place. In a recent New Republic piece, Nate Cohn argued that Davis has no shot of winning statewide office Texas — all the time rigorously avoiding any mention of late-term abortion. Time magazine asks: Is she Cinderella or Joan of Arc? In a Politico column, ambitiously titled “Abortion is a winning issue for Wendy Davis,” Jason Stanford, a Democratic consultant from Texas, tells us abortion is a political winner without ever telling us Davis’ position. The Marine Corps officer who filed a complaint against the commandant for intervening in the Taliban urination cases against eight Marines is now the target of reprisals from superiors, his attorney says. Retired Marine Col. Jane Siegel, who is representing Maj. James Weirick, said superiors have subjected the major to retaliations since it became known that he filed a whistleblower complaint against Gen. James Amos, the commandant and Joint Chiefs of Staff member. Maj. Weirick, a staff judge advocate at the Combat Development Command at Quantico, Va., accuses Gen. Amos of violating the military edict against unlawful command influence by urging guilty verdicts to the general overseeing the cases. The new New York Times/CBS poll shows President Obama underwater on his job approval, with 49 percent disapproving, 43 percent approving, and no gender gap whatsoever. Independents are even more sour on the president’s performance, at 50-40 unfavorable. Only 18 percent of Americans believe Obamacare will benefit them personally, versus 39 percent who expect to be harmed personally. The group most likely to predict a personal benefit? Democrats, at 31 percent. Right behind them are 18 to 29 year-olds, the least likely to benefit because of the way the law is designed, and the most likely to face large premium increases when the exchanges go online. Was Tip O'Neill a terrorist with his 12 shutdowns? Congressman Labrador schools Chris Mathews on his former boss's shutdown of the government. The disclosure in August of a terrorist plot by Al Qaeda has caused more damage to American counterterrorism efforts than the vast trove of data from Edward Snowden, the former N.S.A. consultant, analysts said. These kind of leads reveal our sources and methods of acquiring intelligence on enemy plans and plots in progress. That allows the enemy to change their methods of communication and re do their planning for their mass murder attacks. I cannot think of anything good that comes from leaks of enemy plots. US: Harvard study shows gun control doesn’t save lives What is also interesting is that it is not a new study, but it is one that anti gun left media choose to avoid. One fact from the study--Luxembourg bans all guns, but has a murder rate nine times higher than Germany which has 30,000 guns per 100,000. In Western news-making and opinion-forming circles, there’s a palpable reluctance to talk about the most noteworthy thing about modern Islamist violence: its barbarism, its graphic lack of moral restraint. This goes beyond the BBC's yellow reluctance to deploy the T-word – terrorism – in relation to the bloody assault on the Westgate shopping mall in Kenya at the weekend. Across the commentating board, people are sheepish about pointing out the historically unique lunacy of Islamist violence and its utter detachment from any recognisable moral universe or human values. We have to talk about this barbarism; we have to appreciate how new and unusual it is, how different it is even from the terrorism of the 1970s or of the early twentieth century. We owe it to the victims of these assaults, and to the principle of honest and frank political debate, to face up to the unhinged, morally unanchored nature of Islamist violence in the 21st century. So last week, while most of the country was talking about football or fears of a government shutdown, Rasmussen released a poll that should worry everyone -- but especially incumbent Democrats in Congress. According to Rasmussen's survey, most Americans think the IRS broke the law by targeting Tea Party groups for harassment, but few expect it to be punished. Fifty-three percent think the IRS broke the law by targeting the Tea Party and other conservative groups like the voter-integrity outfit True The Vote; only 24% disagreed. But only 17%think it is even somewhat likely that anyone will be charged, while 74% think that criminal charges are unlikely. Officials with the Consumer Financial Protection Bureau are monitoring 80 percent of Americans' credit cards and 95 percent of their mortgages. The Department of Health and Human Services is collecting “social and behavioral” data for patients' health care records. These are the latest additions to the deeply personal information that federal bureaucrats have been empowered to access in recent years under programs initiated by President Obama. Intrusions into the privacy of individuals and families on this scale are without warrant for a government that is supposed to be limited. Were Democrats trying to get Darrell Issa killed or get him to cancel his Libya trip as part of their Benghazi cover up? Issa feared targeted by terrorists after Democrats revealed secret Libya trip The State Department said the release of information about the trip put Issa's life in danger as did Libyan officials. Issa was not deterred and fortunately was not attacked during his trip. Many Democrats are genuinely puzzled about Republicans' continuing opposition to Obamacare. It is the law of the land, these Democrats say. Critics should accept it, as critics accepted Medicare. They should work constructively and across the aisle with Democrats to repair any flaws and make the law work to help people. Historical analogies are often useful but can be misleading. Certainly so in this case: Republicans, like it or not, are behaving differently from the way they behaved after the passage of Medicare in 1965. To understand why there is continued resistance to Obamacare, and why majorities of voters continue to oppose it in polls, a different historical analogy is helpful. It is an example of a law that was bitterly opposed but that was accepted by opponents to a much greater extent than even many of its advocates expected: the Civil Rights Act of 1964. If Obamacare is so great, why isn't the government using it? Judge Jeanine finds problems, and on the street interviews show New Yorkers don't understand the thing. On March 30, 2010, President Obama signed the non-ironically named Affordable Care Act. That was 915 days ago. From the moment the last of the 22 pens he used to sign the bill into law left the parchment, the federal government has been gearing up — and, of course, collecting cash — for Day One, non-ironically set 915 days in the future, Oct. 1, 2013. In the meantime, though, the community organizer from Chicagoland exempted everyone in his administration from the new law (as well as lawmakers and staffers in Congress). Lots of campaign donors and business buddies in blue states got waivers, too. But everyone else has to fall in line and get set for the federal government to gain an unfathomable degree of control over their lives. David Gregory was over matched in this interview with Sen. Cruz. Harry Reid was not represented in the contest, but Cruz made it clear who was responsible for a government shutdown. Officials are warning that despite fevered efforts, the new online markets where people can shop for health plans will not be fully operational at first. They should acknowledge the obvious and accept the one year delay proposed by the GOP House. ... That si a pretty apt description of what the Democrats are up to. The Republican leading the fight to defund President Obama's healthcare law called Democrats “absolutist” on Sunday for refusing to budge as a government shutdown looms. Sen. Ted Cruz (R-Texas) told NBC's "Meet the Press" that Senate Democrats have offered “zero” compromise and will be the ones responsible if the government shuts down Tuesday. The Republican-led House approved early Sunday a government spending bill that delays the healthcare law for a year, which Senate Democrats say is a non-starter. Cruz suggested that he could get on board with a simple delay of the law if the Senate takes up the House bill. Israel's Shin Bet security service on Sunday announced the arrest on September 11 of an Iranian "spy" carrying photographs of the US embassy in Tel Aviv. News of the arrest was released just hours after Prime Minister Benjamin Netanyahu left for Washington and New York, determined to expose what he described as "sweet talk" by Israel's arch-foe Iran. The suspect, holding a Belgian passport, was sent to Israel by Iran's elite Republican Guards and arrested at Tel Aviv's Ben Gurion international airport, Shin Bet charged in a statement. The domestic intelligence service identified him as Ali Mansouri, 58, and said he had enrolled in a "special operations unit of the Revolutionary Guards responsible for numerous terrorist attacks around the world." He had been using the fake identity Alex Mans after being recruited last year, the agency said, naming his four alleged handlers as senior Iranian officials. This si pretty funny stuff, and that is because it contains a grain of truth in each story. The emotions generated by Cruz are of a degree not normally found in debate. The closest parallel is the reception of liberals and moderate Republicans to Sarah Palin’s vice presidential nomination in 2008. On the surface Cruz and Palin could not be more different: he a Princeton- and Harvard-educated lawyer, she a small-town mayor and Alaska governor whose record, let us recall, was nowhere as conservative as her later television persona. But the two are now allies—Palin endorsed Cruz in his primary last year—in the populist conservative wing of the Republican Party. That wing of the party is much smaller than one might assume based on reading the newspapers and magazines, watching television, and listening to radio. Populists are the minority of a minority, in the U.S. Senate in particular. Funny, that this minority persuasion arouses such ire from the writers and producers and politicians at the top of the bipartisan food chain. Climate change: this is not science – it’s mumbo jumbo The IPCC’s call to phase out fossil fuels is economic nonsense and 'morally outrageous’ for the developing world Their assumptions have been proved invalid, yet they double down on them. While they call those who disapree with them "deniers" the people responsible for the UN report are in deep denial about the failure of their computer models which had predicted significant warming when there has been none. Anybody wanting to lampoon the Obama presidency is out of luck — there is no way to top the real thing. From being outmaneuvered by Russia to erasing red lines in Syria and getting snubbed by Iran, September was the cruelest month. That’s only half the bad news. For as small as the president looked abroad, he looked downright childish at home. He is following his failure to negotiate successfully on the world stage with a refusal to negotiate at all at home. His message to Republicans on both the debt ceiling and ObamaCare is the same: nyet, nyet. Call him confused about who the enemy is. The dynamic is startling. The more the world pushes Barack Obama around, the more he pushes back at home. It reminds me of a Mort Sahl joke from the Cold War: Every time the Soviets lock up an American, we retaliate by locking up an American. It’s “use it or lose it” time as agencies make a blitz of expensive decisions in an attempt to spend their allotted funds by Sept. 30. This should be an embarrassment to the Democrats, but probably will not be. It is an example of the fact that there are large potential saving in every aspect of government. The sequester has not stopped the bleeding and Nancy Pelosi's suggestion that there is nothing left to cut looks ridiculous. Ten states where Obamacare wipes out existing health care plans Thousands of people in the 10 states listed are not going to be able to keep their current health plan under the Obamacare monstrosity. Suspected Islamist gunmen have attacked a college in north-eastern Nigeria, killing up to 50 students. They were shot dead as they slept in their dormitory at the College of Agriculture in Yobe state. The politician said two vanloads of bodies had been taken to a hospital in Yobe's state capital, Damaturu. One hospital source told Reuters news agency that 26 bodies had been brought there. College provost Molima Idi Mato, speaking to Associated Press, also said the number of dead could be as high as 50, adding that security forces were still recovering the bodies and that about 1,000 students had fled the campus. Shin Bet probe reveals scope of Hamas money laundering through Chinese banks It is an interesting twist on how the death cult is funded. The Obama Crime Family could give the mob lessons. Don Obama plays for keeps. The Don gets what he wants and when he found himself in danger of losing his power and control, Obama went to his enforcers – the IRS. In a story reminiscent of the mob fixing union elections, the IRS enforcers conspired to destroy Don Obama’s main competition – the Tea Parties and other conservative fundraising groups. Lois Lerner was only one of many IRS big shots in DC who gave orders to IRS offices across the U.S. to “kill” the Tea Parties and other conservative groups. Their goal – steal the election. As if only days ago, the “fall gal” retired from the IRS. We can only guess what kind of massive payoff she received from Obama’s donors. Despite rising production and commodity prices, investing at North American oil fields has turned sluggish. This year marked only the third time in more than a decade that North American producers budgeted less than their cash flow forecasts allowed, reversing a trend that buoys sales in the U.S. oil field services sector and job creation in energy hubs, including Houston. At first glance, it’s strange: No unexpected surge in prices pushed up cash flows, as in 2005, and no dead stop in the credit markets hit spending, as in 2008. Oil and gas remains a robust industry chasing the fruits of triple-digit oil prices. But the spending downturn of 2013 had several catalysts — last year’s lower expectations for commodity prices, increased shareholder pressure for financial discipline and the retrenching of Chesapeake Energy, which was the largest driller in the nation two years ago. House GOP insiders acknowledge a shutdown is increasingly likely, due to House conservatives’ aversion to passing a “clean” continuing resolution that simply funds the government. But the leadership isn’t ready to concede defeat, and, behind the scenes, Speaker Boehner and his allies are finalizing their strategy for the eleventh hour. Here’s how it could play out, according to sources familiar with the leadership’s closed-door deliberations. First, the House passes a CR today that delays Obamacare’s implementation for one year and repeals the medical-device tax. This legislation will almost certainly die a quick death in the Senate. Should that happen, the House will send another bill back — and here’s where it gets interesting. The leadership is mulling several options. At the top of the list is a revised CR that includes the Vitter amendment, authored by Senator David Vitter (R., La. ), which would eliminate Obamacare subsidies for congressional staffers and members. CNS News has the story. If you're an aficionado of oil and gas, their respective histories, and investing in the companies that produce them, you know all about the newly hot Eagle Ford play in South Texas and the Bakken/Three Forks in North Dakota and Montana. For my money, however, the most colorful and geologically fascinating of the plays in the onshore U.S. is the Permian Basin. Whereas the Eagle Ford is a mere kindergartner at five years old, and the Bakkenis more senior, with production dating back more than half a century, the Permian is a nonagenarian play that's recently become friskier than ever. As you likely realize, the Permian region which covers much of West Texas and southeastern New Mexico through a 250-mile by 300-mile expanse, has, like the Bakken, found new life through the development of hydraulic fracturing and other technological wrinkles. It is exactly how he got the Obamacare fiasco passed to begin with by rejecting Republican ideas. He just lacks basic leadership skills. ‘It’s the law of the land”: This is rapidly becoming the preferred shorthand argument for why criticism of ObamaCare is just so, so wrong. It also serves as the lead sentence of a larger claim that all attempts to overturn the Affordable Care Act are really symptoms of a kind of extremist right-wing lunacy. Where to begin? For starters, I know a great many self-described members of the Tea Party, and I’ve yet to meet one who wouldn’t acknowledge — admittedly with dismay — that ObamaCare is the law. Nor have I met one unwilling to concede that the Supreme Court ruled that ObamaCare is constitutional. The movement born to oppose the health-care law is gaining momentum, but its resurgence poses political risks for the GOP. The political risk for the Republicans is if they ignore the passions of the people who got the majority in the House to start with. One way they can lose is if they attack Ted Cruz because of his keeping of a promise to fight Obamacare. A fervent group of conservatives is harnessing the power of the Internet, determined to tell the story of the current budget showdown on its terms. It is harder for Democrats to suppress the conservative narrative on events. The administration and many of its supporters have resorted to name calling an insults. 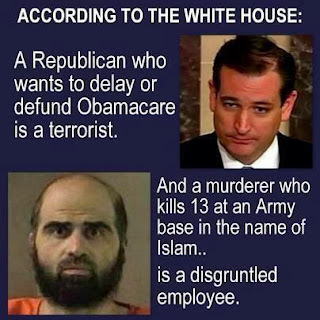 Note the graphic in a post below comparing their description of Ted Cruz and conservative Republicans to their description of the Fort Hood shooter. Government shutdown. Federal default. These looming political threats to the U.S. economy might scare investors to buy more U.S. Treasuries in the coming days as they seek a shelter for their cash. While a protracted government shutdown, and particularly a default, could harm to the image of Uncle Sam's debt, its safe-haven appeal looks unchallenged in the short term. Worried about rising chances that federal workers and contractors won't get paid if much of the government shuts down on October 1 amid a political standoff in Washington, investors are expected to go by the conventional crisis playbook - dumping assets perceived to be higher-risk and rushing into those seen as lower risk. ... The government will slash spending before it would default on its debt. The markets know that and they still see treasuries as a safe investment. If Obama actually challenges that assumption the debacle would be on him. Remember when a political leader rose to prominence based on their experience, strength of character, moral integrity, and leadership ability? Me neither. But it was once generally considered bad for one’s career to publicly extol the virtues of murdering innocent children. Now, it seems one woman (a term I use loosely) is attempting to break the golden-domed ceiling, and run for governor…based solely on her passion for killing babies. Wendy Davis is a “celebrated state senator,” if you read the NY Times. But her sole claim to fame rose from this summer’s fight over abortion regulations in Texas…remember, the pro-abortionists’ tampon bombings, hate-filled mob protests, “Hail Satan,” etc.? Tea party and GOP activists in Bexar County joined Friday to condemn the federal Affordable Care Act and urge voters to support Sen. Ted Cruz's efforts to defund the program. They also shared their dismay with Sen. John Cornyn, the other Texas Republican in the Senate, for not sufficiently backing Cruz, who this week gave a 21-hour Senate speech against the insurance program known as Obamacare. That is a pretty good summary of where this White House is in dealing with real terrorist and in engaging in insulting name calling rather than rational debate with those who disagree with their policies. Houston is the energy capital of the world. And word has spread internationally that the energy in Texas is far greater than fossil fuels alone. From hydraulic fracturing to wind generation to carbon capture and storage, Texas is a leader in innovation. Houston is increasingly delivering the low-carbon energy solutions that nations worldwide are seeking, and we in the United Kingdom are no exception. We have long been a partner of choice in Texas with many British energy companies calling Houston home. The U.K. is the largest foreign investor in the state and U.K.-owned businesses are responsible for over 70,000 Texas jobs. E-commerce giant eBay Inc. is doubling up a data center in South Jordan and deploying new technology to power it. San Jose, Calif.-based eBay is opening a new addition at the data center and using Bloom energy cells that convert natural gas into electricity without combustion. The company plans to generate even more electricity off-site by capturing the waste heat of a nearby natural-gas compressor station, in a partnership with geothermal company Ormat. That power plant will be operating in about 18 months. ... The story does not give many details but it sounds like an interesting technology. If it could be scaled for home use at a reasonable cost, it would be a real game changer. Bill Whittle describes the importance of a military confrontation over international waters in the Arabian Gulf. Kenyan police have arrested eight people in connection with the attack on the Westgate shopping centre in Nairobi in which at least 67 people died. Three others have been released after questioning, said the interior minister, Joseph Ole Lenku. "Police are holding eight suspects as they seek to unmask the faces behind the terror attack," he said. All eight are being held under counter-terrorism legislation, which allows detention for long periods without charge. The government also said that an international arrest warrant issued on Thursday for the Briton Samantha Lewthwaite, while not linked directly to the Westgate attack, was part of the ongoing security operation. "In view of the security situation, the level of Interpol alertness has been raised in respect to known global terrorists including the British woman Samantha Lewthwaite," a statement said. Laura Bush is still pushing to help the Afghan women. A former Army sergeant is under arrest in a federal sting operation that focused on a team he allegedly supervised in international drug trafficking and planned killings, according to the U.S. attorney in Manhattan. Joseph Hunter, 48, led a "security team" of former soldiers from around the world to assist Colombian narcotic traffickers, federal authorities allege. Hunter, along with Timothy Vamvakias, 42, an American who also served in the U.S. Army; Dennis Gogel, 27, a German national who served in the German armed forces; and two other men acted as the security team that surveyed the transportation of what they believed to be illegal drugs. The men acted as "contract killers" who planned to eliminate anyone who threatened the drug trade -- including law enforcement agents, a press release from the U.S. attorney's office said. Why is “Abortion Barbie” off limits for Wendy Davis? He does a good history of how the left tagged Sarah Palin as “Caribou Barbie.” Why the left thinks her abortion stand will be popular in Texas is a real head scratcher. Her stand does not have a majority support in the US, much less conservative Texas. It is also unpopular with Hispanic voters whom she will be hoping to lean on as a Democrat. The chances of her winning the Texas governor's race are remote. The best she can hope for is an Obama appointment after she loses. The Obama administration is ignoring China’s transfer of mobile nuclear missile launchers to North Korea as Secretary of State John Kerry on Thursday applauded China for announcing new export controls on Pyongyang’s arms programs. Six Chinese transporter-erector launchers (TELs) were sold to North Korea in 2011 and were first revealed carrying new intercontinental ballistic missiles (ICBM) during a Pyongyang military parade in April 2012. The launchers are now part of North Korea’s newest and most-lethal road-mobile nuclear KN-08 missiles, which are capable of hitting parts of the western United States. Obama Scorns G.O.P. ‘Blackmail’ on Health Law Doug Mills/The New York Times President Obama addressed a crowd in Maryland on Thursday, discussing the benefits of the Affordable Care Act as well as the recent criticism from the Republican Party. Days before the law’s main elements take effect, President Obama mocked opponents for “crazy” arguments and accused them of trying to “blackmail a president” to stop the law. Does Obama have a short term memory problem. Even the NY Times seems to have the problem, because when Obama was a senator he tried to do the same thing to stop the Iraq war using the debt ceiling as a way to stop funding. Only he did not call it blackmail back then. It was just leverage in a negotiation. What we are seeing is a dishonest attempt to cut off debate about his priorities. The laws of supply and demand are beautiful things – expressions of logic as elementary as the basic laws of physics, which govern everything except the more unruly subatomic particles, which thumb their noses at laws, dress like slobs, and listen to the kind of music that drives their parent atoms crazy. Supply and demand even applies to the use of government power, although the highest imperative of socialism is to pretend otherwise. There is always enormous demand for government. Lots of people want State power to be deployed for their benefit, or to punish their competitors. (That’s why Big Business is not at all antithetical to Big Government.) There is a bottomless appetite for “free” goodies. Lots of people will always believe that any given social problem can be solved through the application of coercive force, which they prefer to think of as “political leadership” – smart people rolling up their sleeves and bringing order out of chaos.